These are the best Italian food blogs that most reflect the real, authentic Italian cooking, the blogs that sometimes I refer to. These are English written blogs that I have listed and reviewed from my Italian food blogger perspective. This list is by no means complete, and the choice is expressed upon the authenticity, quality and quantity of the recipes made. As today we can see many Italian recipes which are far too Americanized and an eye was dedicated to food photography as a quality factor as well. These bloggers spend a deal of time and patience taking awesome pics of their recipes for us to watch and make our mouth-water. 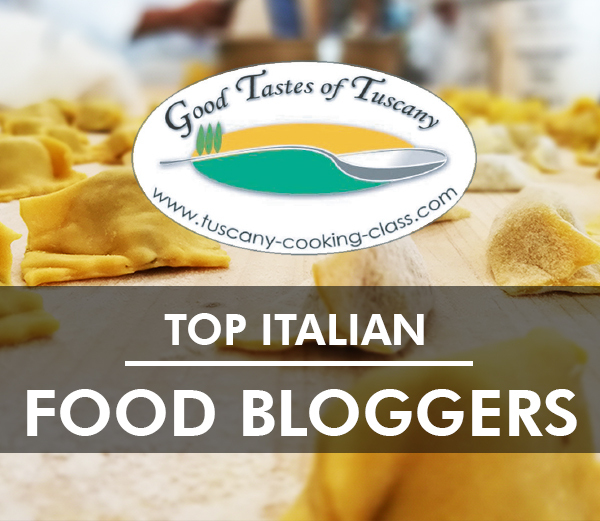 Tuscany Cooking Class in Florence (Italy) has another list of top Italian food bloggers that you might like to follow. Frank Fariello’s MEMORIE DI ANGELINA is a labor of love for Italian food, he's a real, authentic Italian food blogger. You can browse Frank’s blog by courses or by regional cooking. He knows it all about when it comes to Italian food, with hundreds of authentic Italian recipes to choose from. I still have to find a better authentic Italian food blog than Frank’s. It’s a must read. After 7 years spent in Florence, EMIKO DAVIES author of the blog with the same name has got an high grasp of Tuscany cooking. From appetizers to desserts she made them all sharing techniques and history behind many recipes. You’ll find travels she did and still doing today as a lifestyle across Tuscany. The serious Italian cook Deborah Mele, author of ITALIAN FOOD FOREVER, fell in love with Italian food about 40 years ago, when she married into an Italian family. Traveling across Italy, she “stumbled” upon Umbria Italian region where now she lives, moving to and from US. Her blog features a large recipe collection, focused almost on central Italian cuisine. CHRISTINA’S CUCINA As Christina Conte states she’s on a mission to save authentic Italian dishes from extinction. Aunt Iolanda’s Gnocchi With Oxtail. Want your best Carbonara? Follow Christina’s recipe and Try To Make Pancetta At Home. The main ingredient for carbonara. An Italian in Scotland, Federico Pezzaioli author of the blog ITALYUM. Federico has come up with a great section dedicated to Italian bakery﻿ with bread & cakes. Another whole section goes just for pizza recipes, and obviously pasta is there too. Unfortunately, the food photography is not so great and mouthwatering as I expect it to be from a food blog, but I know the recipes are surly good anyway. ANNA MARIA VOLPI Anna Maria’s kitchen is open with an Italian menu featuring some of Italy’s regional cooking. Recipes have step-by-step pictures that will guide you through the method, making the recipe more easy to follow from her basic Italian preparations, to how to make and cook pasta to making ricotta cheese. 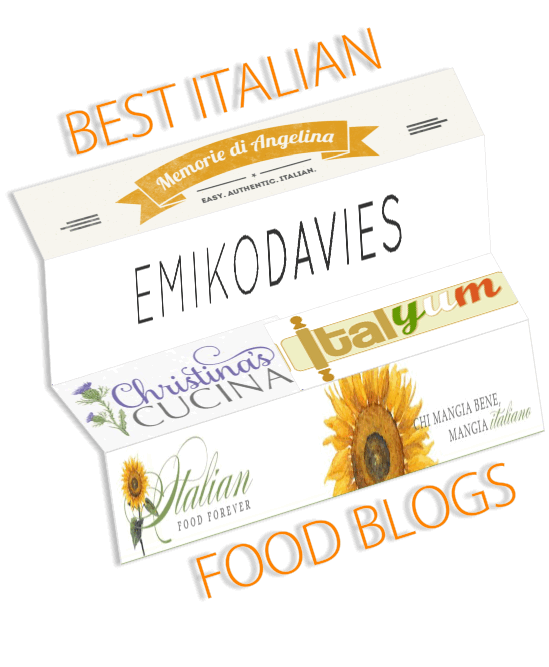 I've searched the web and chose (wasn’t an easy thing to do) the best Italian food blogs I browsed. Searching for authenticity, quality and quantity of the recipes as I wrote at the beginning of this page. The author, of course, might have on their blog much better posts, pages, categories or archives than I have suggested you here. Yes, you could not agree with me, with this list. If so, just let me know, and we can always open a friendly discussion about this topic in the comment section of this page. The list could become longer with time, as I might discover other authentic Italian food blogs while browsing the web. If you have noticed any other that I haven't listed yet, I invite you to let me know about them. Mine (pinchofitaly.com) is not mentioned here, because it wont be fare to do so. But I leave it to you, in the comment section below this page. Give me your comment/opinion about pinch of Italy blog if you like to.